Back of house and deck from the side yard. Large family/dining room with 12 foot French slider to deck. 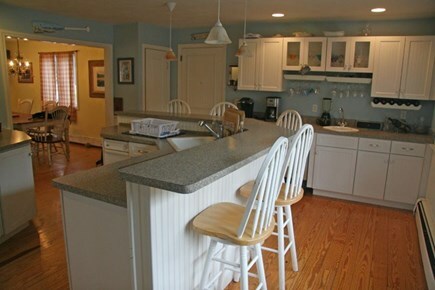 Large center island in kitchen great for gathering. 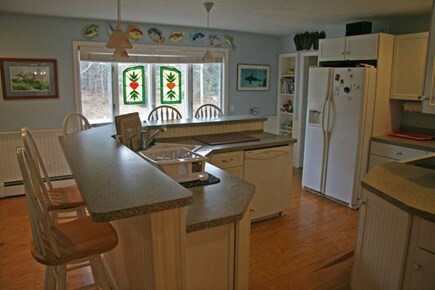 Kitchen also features separate wet bar for entertaining. Queen 1st floor Master with TV and separate sitting area. 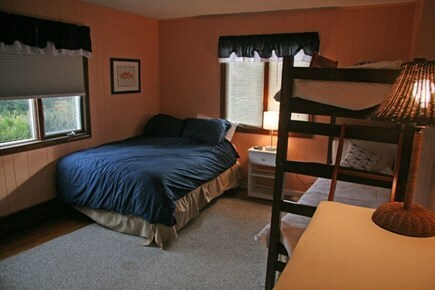 1st floor bedroom with double and bunk bed. 2nd floor King Master with TV and sitting area. 2nd floor bedroom with 2 twins, bunk bed, and queen sofa bed. 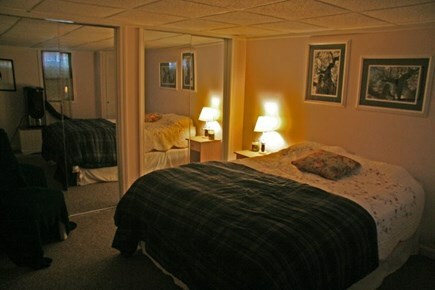 Basement bedroom with queen bed and TV. Basement full bath with washer and dryer. 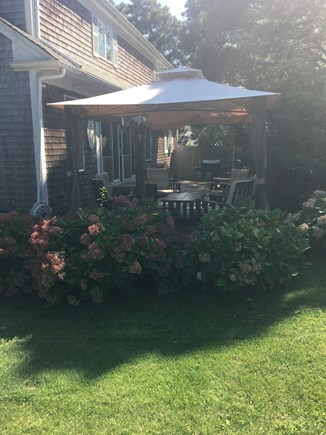 Screened or open hut on deck with Hydrangeas. 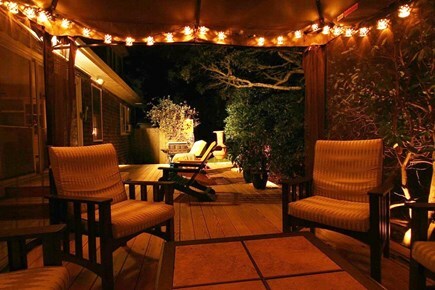 Enjoy the night air on the deck. 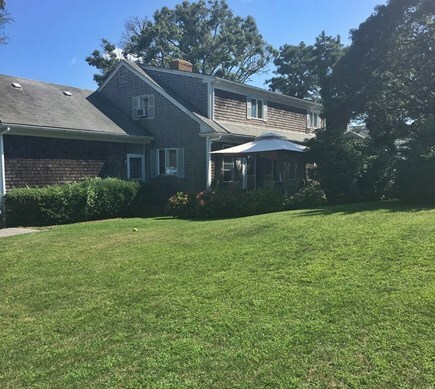 This beautiful, large home (5 bedrooms, 3 ½ baths) is located in Harwich Port within walking distance of plenty of activities, shopping, grocery store, restaurants, and the beach. The entire house has been updated and is perfect for two families vacationing together or a large, extended family reunion/vacation. This house sits on a private 1/3 acre of land and sleeps 14-16 people comfortably. The first floor was refurbished in 2008, with a new kitchen, new appliances, new beds, new furniture, and new or refinished hardwood floors throughout. 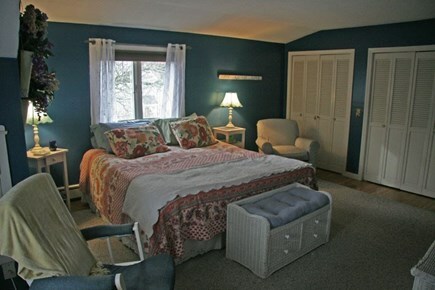 The second floor was also refurbished with a new bathroom, new beds and new or refinished hardwood floors throughout. Both floors were freshly painted and a new outdoor shower was installed. A new deck was built in 2015 that is great for entertaining with grill/fire pit and added screened in hut great for enjoying the night air. The basement was also completely refurbished, adding over 1,000 square feet of living space. The house has cable TV, HD TVs, WiFi, gas grill, window unit AC's in all bedrooms, washer/dryer, linens, beach chairs, beach towels, bikes, and also a small office area with a printer for anyone taking some work with them on vacation. Family Room -- Large room with a 42'' flat-screen HD TV, with sectional sofa, comfortable armchairs for relaxing and table that seats up to 10 for meals and /or playing games. Kitchen -- Fully equipped appliances including dishwasher, trash compactor, and large center island great for gathering and eating. Separate wet bar comes in handy when entertaining. Master Bedroom -- Queen bed with full bathroom. TV and sitting area to enjoy a little quiet time. 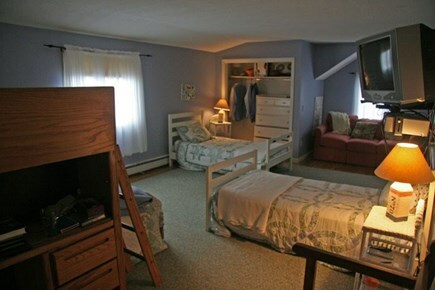 2nd Bedroom – Double bed with additional bunk bed and TV. 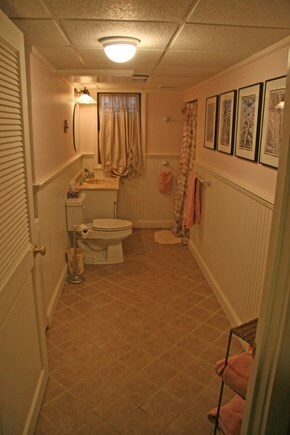 Half bath located in between bedrooms for convenient use late nights. 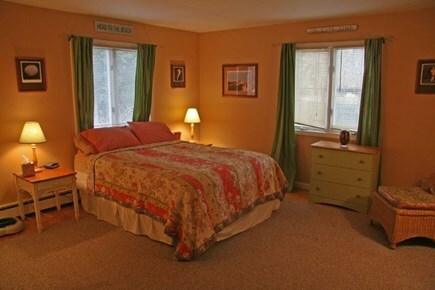 Master Bedroom -- King bed w/ TV and comfortable chairs for quiet time and own door to new full bathroom. 2nd Bedroom -- 2 Twin beds, bunk bed, and queen sofa bed. Bathroom -- Full bath with washer and dryer. 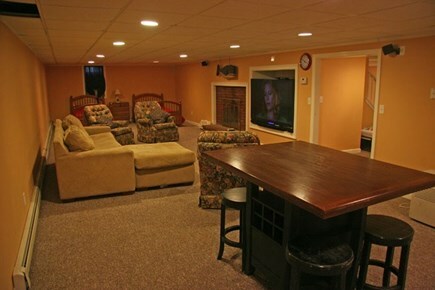 Family Room -- Over sized family room has 50'' TV with surround sound great for watching movies. There is also a pub table for playing games. Two twin beds and and a queen sleep sofa provide additional sleeping quarters. Outside -- 2 large driveways provide parking for up to 10 cars. 12' Slider off family room leads to 34' deck and a private shaded back yard. Screened hut on deck provides a fun gathering area day or night. There is also a gas grill, fire pit, and outdoor shower -- perfect for relaxing and entertaining family and friends. Beach -- Walk or bike only 1/2 a mile to the Nantucket Sound shore. Or take a day to ride the waves on the National Seashore only a 15 minute drive away. Cape Cod Bike Trail -- Less than 1 mile to jump on the bike trail and enjoy 22 miles of paved trails from South Dennis to Wellfleet. Ferry to Nantucket -- Leaving Saquatucket Harbor and less than 1 mile away. Walk to Go-carts, bumper boats, batting cages, jumpolines, gift shops, Dairy Queen, Harwichport House of Pizza, and A&W. Additional pricing info: Pricing does not reflect a $500 refundable security deposit and a $300 cleaning fee per rental. State and local taxes of 12.45% will apply. We had a group of 12 stay at this property for a long weekend. The host was more than accommodating and very responsive. The house was well-kept with three floors and plenty of sleeping areas. He even offered to have us come a night early free of charge since several of us staying were in a wedding taking place that weekend. The outside was very charming and had a nice seating area. Overall, I would highly recommend this property, and we hope to come back! The Morgans(Mike/Eileen) and Komarnickis(George/Janet) have been vacationing together in Harwichport for over 25 years. In 2003 they confirmed their love of the area when they purchased this home together while raising 5 kids between them. The 5 kids have grown up together living, attending camps, and working together over the years and still look forward to their time together in Harwichport. Our home has, and continues to, provide special memories for both of our families and hope the same for you while vacationing in such a beautiful part of Cape Cod. Location and space. The location is great for access to all that Harwichport has to offer. Within walking distance are beaches, activities for kids, ice cream, grocery store, and a quaint little downtown with shops, cafes, restaurants, and bars. Fishing charters and sightseeing cruises along with the ferry to Nantucket are less then a mile away at Saquatucket Harbor. And the Cape Cod bike trail is only 1 mile away connecting you to 22 miles of fun trails to explore. 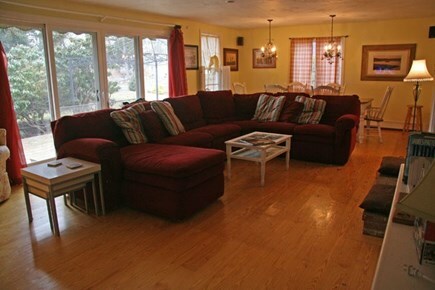 The space is perfect for two families or a large extended family. 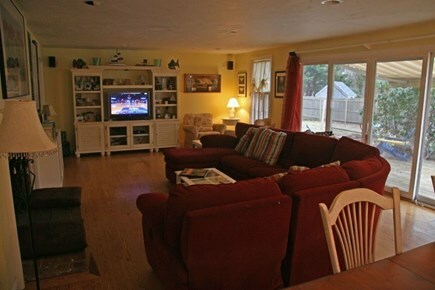 There are two large family rooms which allow for adult and kids areas if all do not want to hang out together. And if someone just wants to enjoy some quiet time alone they can retreat to their bedroom or the shaded part of the back yard to relax in the hammock and read or take a nap. The 34 foot deck is a great place for entertaining outdoors with a screened in hut. Or, like we do many nights when entertaining, gathering around the island in the kitchen for drinks and appetizers with friends and family. Close to all that Harwichport has to offer yet secluded enough for you to still enjoy some privacy. Harwichport is located in a perfect area geographically. Not only is there plenty to do within walking distance, but there are also a number of attractions within a short drive. For the baseball enthusiasts, Harwich sponsors a team in the prestigious Cape Cod Baseball League playing their home games at Whitehouse Field, less than 2 miles from the house. And right next door to Whitehouse Field is Cranberry Valley Golf Course, a public course considered one of the hidden gems on Cape Cod. Just a 7-10 minute ride up Rt. 28 to the east is the town of Chatham featuring a great downtown packed with all kinds of shops, boutiques, restaurants, cafes, and activities. Another 10 minutes up the road from Chatham is Nauset Beach, part of the National Seashore, where you can enjoy the waves. Traveling to the west of Harwich on Rt. 28, only 5 minutes away, is Dennisport which boasts many options for food, drink, and activities for both kids and adults.